First elected to the House of Representatives in 1992, Deborah Pryce rose through the ranks of leadership to become Republican Conference Chair a decade later, making her the highest–ranking Republican woman in House history. As a member of the Financial Services Committee and as a Deputy Whip, Congresswoman Pryce drew on her background as a former judge and prosecutor to act as a consensus builder in the House.1 Her legislative interests ranged from consumer financial protection to pediatric cancer and adoption practices. Deborah Denine Pryce was born in Warren, Ohio, on July 29, 1951. She graduated from Ohio State University in 1973 and received her J.D. from Capital University Law School three years later. From 1976 to 1978, Pryce served as an administrative law judge for the Ohio state department of insurance. She worked as a prosecutor and municipal attorney for the city attorney’s office of Columbus from 1978 to 1985. Pryce served two terms as the presiding judge in the municipal court of Franklin County from 1985 to 1992. In 1990, she adopted her daughter, Caroline. After Caroline’s death from cancer in 1999, Pryce founded Hope Street Kids, a nonprofit organization devoted to curing childhood cancer. In 2001, she adopted a daughter, Mia. From the beginning of her congressional service, Representative Pryce occupied a leadership position. Elected Republican freshman–class president in 1993, Pryce also was named to the congressional Republican transition team in the following Congress, when Republicans gained control of the House for the first time in 40 years. Two years later in 1996, she was selected a Deputy Majority Whip for the Republican Party. In 1998, GOP colleagues elected Representative Pryce Secretary of the House Republican Conference, the body that oversees the organization of the party. Pryce ran unopposed for the Republican Conference Vice Chair spot in 2000, and in the race for Conference Chair for the 108th Congress (2003–2005) she defeated two opponents to become the highest–ranking woman in the Republican Party. She was re–elected GOP Conference Chair for the 109th Congress (2005–2007). 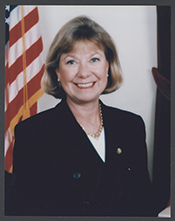 When Pryce first took her seat in the 103rd Congress (1993–1995), she received assignments on two committees: Banking, Finance, and Urban Affairs; and Government Operations. In the 104th Congress (1995–1997), Pryce left those assignments when she received a seat on the prestigious Rules Committee, with oversight of all legislation headed for floor debate. Aside from a brief stint on the Select Committee on Homeland Security in the 107th Congress (2001–2003), Pryce’s committee focus was on the Rules panel. In the 107th and 108th Congresses, she chaired its Legislative and Budget Process Subcommittee. In the 109th Congress, while Republicans still controlled the House, Pryce left the Rules Committee to accept a seat on the Financial Services Committee, where she was the fourth–ranking Member. She chaired the Subcommittee on Domestic and International Monetary Policy, Trade, and Technology. In August 2007, citing the difficulty of keeping up her hectic congressional schedule while being a single parent to her 5–year–old daughter, Representative Pryce announced her decision not to run for re–election in the fall of 2008.5 Her term expired at the conclusion of the 110th Congress on January 3, 2009. 1Amy Borrus, “Is the Day of the Hothead Over? : The GOP Pols to Watch as Gingrich Moves to the Center,” 8 September 1997, Business Week: 72. 2“Election Statistics, 1920 to Present,” http://clerk.house.gov/member_info/electionInfo/index.aspx. 3“Official Biography of Deborah Pryce,” http://www.house.gov/ pryce/biography.htm (accessed 18 July 2006); Politics in America, 2004 (Washington, D.C.: Congressional Quarterly Inc., 2003): 811–812. 4Derek Willis, “Rep. Deborah Pryce,” 28 December 2002, CQ Weekly: 58; “Deborah Pryce,” Associated Press Candidate Biographies, 2004. 5Eric Pfeiffer, “Ohio Republican Lawmaker Pryce to Retire,” 17 August 2007, Washington Times: A5; John McCarthy, “Republican Rep. Deborah Pryce of Ohio to Retire, Boosting Democrats’ Hopes in the Midwest,” 16 August 2007, Associated Press; Jessica Wehrman, “Pryce Tired of Life on the Tightrope,” 20 August 2007, Dayton (Ohio) Daily News: A4. Papers: 1985-2008, 80 cubic feet and 100 gigabytes. The collection documents the 16-year public service career of Deborah Pryce (R-Upper Arlington) as a congresswoman in the U.S. House of Representatives for the 15th District of Ohio. The majority of materials in the collection were compiled by the Washington, D.C. and district offices of Congresswoman Pryce. Campaign materials within the collection were compiled by her campaign committees. In addition, the collection contains records of the House Republican Conference, dating from 1998 to 2006, compiled during Congresswoman Pryce’s tenure as secretary, vice-chair, then chair of the conference. A finding aid is available in the repository and online. "Deborah D. Pryce" in Women in Congress, 1917-2006. Prepared under the direction of the Committee on House Administration by the Office of History & Preservation, U. S. House of Representatives. Washington: Government Printing Office, 2006. The Honorable Deborah D. Pryce explains how her background as a lawyer and a judge helped her as a Member of Congress. The Honorable Deborah D. Pryce talks about how being a mother influenced her role as a legislator.